Roller derby officiating might seem pretty straightforward to the average skater, coach or fan. There are outside pack refs, inside pack refs, jammer refs, a head ref. They call penalties, they blow whistles, they huddle in the middle and decide the fate of the official review. Seems simple. But it is far from simple and there is a lot more to it. It’s not just the language of the rules that makes your head spin; it’s the sometimes intricate way a team of officials needs to work together to make the game a success. When it works it’s like a well choreographed dance — on roller skates and toe stops — but a dance nonetheless. The officials, both skating and non-skating, are a team. They work together on a multitude of levels: track coverage, communicating and collaborating to make sure points, penalties and other stats are awarded, gathered and recorded. This can be great when everyone is doing their job well; but sometimes it can be challenging. When there are visiting officials (or you’re the visiting official) the challenges might come from different styles or habits; or just varying degrees of experience and confidence. The visiting official might walk in, gear in hand, often not knowing what they will meet. Will it be a collection of new people, maybe even fresh NSOs and skating officials who need extra help and maybe even basic training? Or will it be like an extended family reunion filled with people they’ve worked with before? Sometimes walking into a fresher league means an official might need to help check track set up, or train the brand new scorekeeper before the game. It also could mean they expect to jam ref and find out they’re needed to act as Head Referee. Officials need to be flexible. 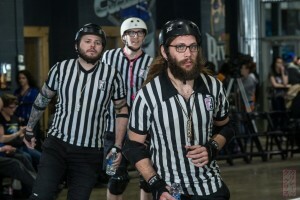 QCRG hosted over 25 visiting skating officials last season. It’s typical for a visiting team to bring a skating official or two but QCRG had officials from neighboring leagues for almost every game of the season. They came from Roc, Niagara, Hammer, Guelph, Massachusetts and other close (and not so close) leagues. 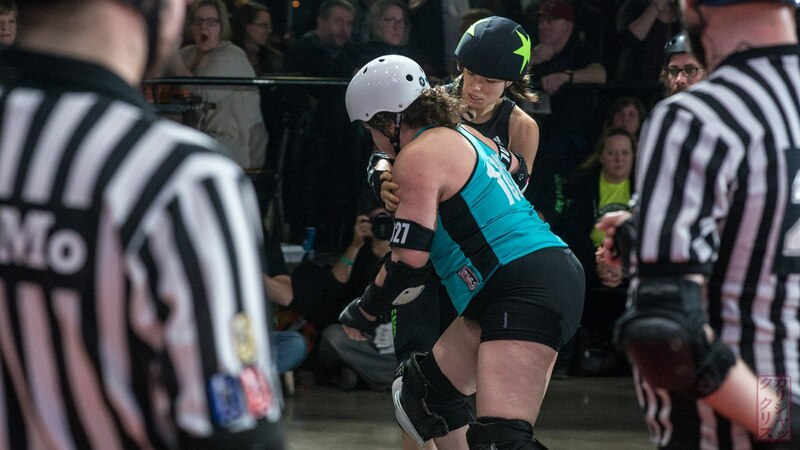 QCRG often brings in top officials like Penny when WFTDA ranking points are on the line. Seven out of the eight skating officials for the Furies/Montreal game came from other leagues (3 of them came from Montreal). 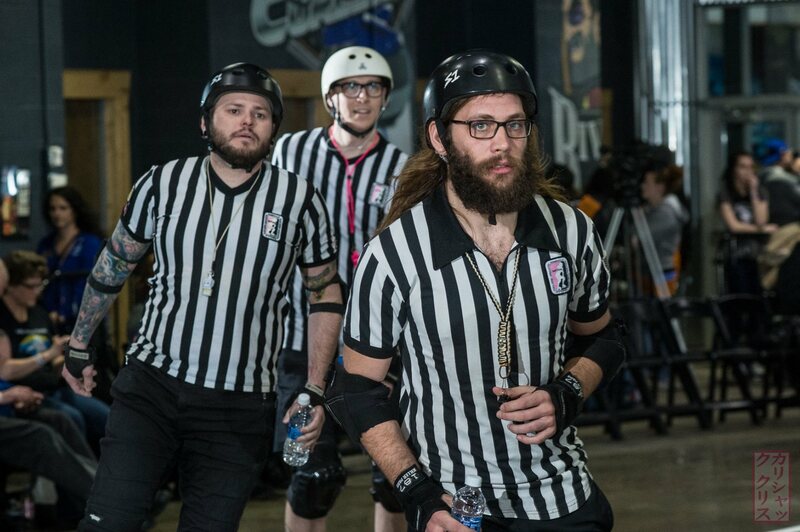 Wiener was the only QCRG referee (and he was a Level 2 WFTDA Certified Referee at one point). But officials from other leagues come in for non-Furies games too. 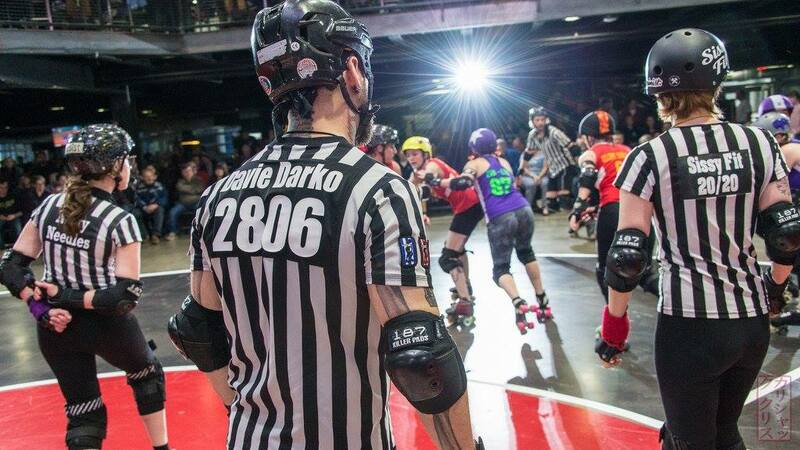 Davie Darko, Head Referee at Roc City Roller Derby has been a regular “visiting” official with QCRG games in the last several seasons as well. “I always enjoy coming to Queen City. I know that production is going to be on point and everything is well run,” Davie said. Davie has officiated for an incredibly wide variety of games. He is the Men’s Roller Derby Association Director of Officiating and a Recognized Official. He is a Women’s Flat Track Derby Association Level 3 Certified Referee. He officiates high level of games and will be at D2 Playoffs in Pittsburgh, the D1 Playoffs in Seattle and MRDA Champs in Cwmbran in South Wales. So why drive an hour or so to officiate a home team game? Wouldn’t he rather stick with high level games? Not necessarily. Wiener and Davie both see the benefit in officiating all levels of game play. “It helps keep my skills sharp,” said Davie. There’s a pretty clear difference in a game between fresh teams, or home teams, and highly WFTDA ranked teams. It can make officiating the variety of game a different experience. The more skill and stability a skater has; the less likely a jammer will knock them out of position when they come into the pack hot. Less stability and skill and more likely for pile-ups, or chaotic falls. Sometimes that means different kinds of penalties. “Games with newer teams can be very mentally challenging because sometimes it’s more difficult to know where to focus,” said Penny. “Higher level derby, particularly at a WFTDA tournament, is just a different level of intensity. Overall I enjoy learning from the skaters and from the other experienced officials that help me improve with every game. Just like any sport, either as an athlete, coach or official, each game is an opportunity to learn and grow. Travelling to other leagues offers different experiences and a sense of family for the day when people come together for a common purpose. When the game is over with and the seven skating officials head to their locker room to degear and talk about the game, they don’t measure their successes in points scored. They might discuss an official review, or an interpretation of a rule. Or they might just bask in the camaraderie of a game well officiated and then head out to the after party.